I’m really sorry it’s taken so long to make another update. I was just enjoying being at home so much I kept putting it off and putting it off until here we are: 1 month later and still no new entries. I’ve been going back to Oklahoma City every week for a check-up and everything went perfectly the first two weeks, but for the last two weeks I’ve had a constant low-grade fever. Last week my doctor started me on a pretty high dose of an antibiotic called Bactrim. It made me more tired than I’ve ever been and I was vomiting almost every day but it still didn’t get rid of the fever, so when I saw her again yesterday she cut the dose WAY down (2 pills a day on MWF instead of 4 a day every day) and ran a bunch of tests (blood cultures, nasal swab, chest x-ray) so hopefully they’ll figure out exactly what’s going on. It’s only been 1 day since my last dose of Bactrim, but I’m already feeling better. It seems like most of the problems I’ve had so far have been caused by the medications, but so far the side-effects have really just been inconveniences more than anything. Besides being tired my hands shake pretty bad sometimes, I have really weird and vivid dreams and dry mouth which make it hard to get any good sleep, and I barely have any appetite. I never thought I’d worry about getting enough calories, but my doctor wants me to have 1500 a day and sometimes it’s really hard to get that many. So far I’ve lost about 35 pounds since I was admitted on October 6th, but I had plenty to begin with so I’m not complaining. I guess that’s it for now. Once again, thanks for reading and I’m sorry it took so long to get this posted. THANKS! Thank you so much to everyone who has supported me through this ordeal. It was one of the most difficult things I’ve ever been through, but the burden was so much easier to bear with such an incredible group of people helping me through the process. So thank you to everyone for the love and support, the kind words an well wishes, the thoughts and prayers, the fundraisers, the blood-drives, and spreading the word about Leukemia and Bone Marrow Donation. This fight is not over, but with Team Cam in my corner I know that all will continue to be well. On Thursday, when I was due to be released, my creatinine levels spiked. This told my doctor that my kidneys weren’t functioning properly and I couldn’t be released until the levels came down to normal (about 1.2). On Friday, the level went up to 4, and yesterday the level was 6.5. It finally started coming down today (about 5) so hopefully I’ll be able to get home sometime this week. My birthday is next Sunday, and I’d really rather not spend it here, but we don’t want to go home until I’m ready. The last thing we would want is to have to come right back up here. Also, there are going to be two blood drives tomorrow (Monday, November 8). One will be in Wilburton at the high school from 12-6PM and the other will be in Tulsa at the OSU College of Medicine (1111 W. 17th St.) from 3-6pm. I’m sorry I didn’t post the details earlier, but I would really appreciate it if anyone who can donate would. 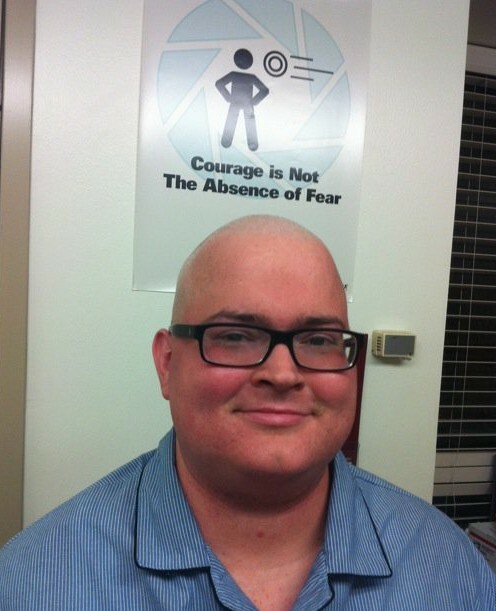 Also, please ask about bone marrow donation, or read more about it here. Today my white counts were 2.1, which means I can kiss my wife again! 😀 My mouth sores are almost completely gone and I’ve still not had any nausea or another fever, so things are going really well. I’ve been really tired the last few days but otherwise feeling good and just ready to go home. Unfortunately, it looks like I won’t be released until Thursday. I’m still on 2 IV antibiotics and my doctor wants to take me off of them one at a time. I’m a little disappointed, even though it’s only one day, but I’m ready to get out of here!!!! That’s all for now (I accidentally took my ambien with my other meds at 10 and I’m about to crash out) but hopefully I’ll have more good news in the next few days. Thanks! We had a few hiccups yesterday, but it looks like we’re still on track and making good progress. My Hickman catheter started looking a little infected on Wednesday, but I wasn’t showing any other signs of infection so my docs just wanted to keep an eye on it. By yesterday morning it was looking pretty nasty. 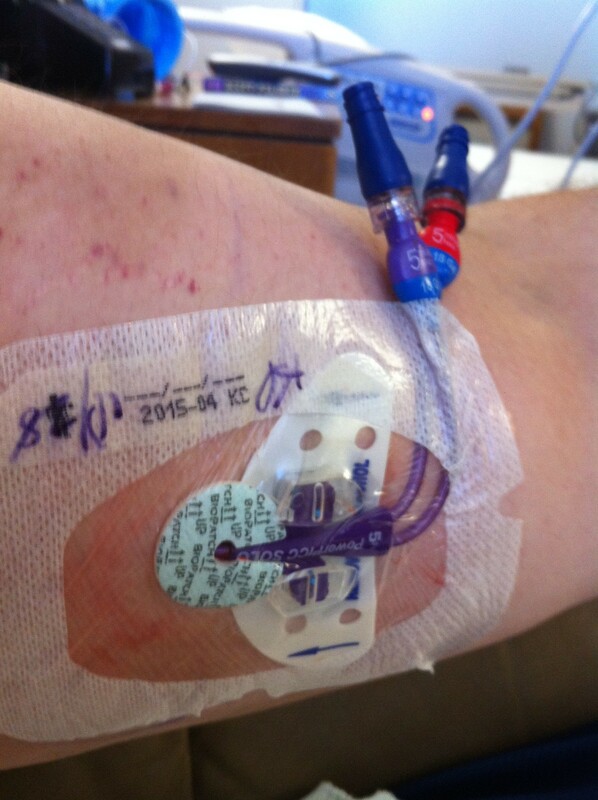 They decided to go ahead and pull it before it started causing problems, but first they wanted to put in a PICC line. That process was much easier than the Hickman. I wasn’t sedated and they just came and set up at my bedside. The line enters on the inside part of my upper arm and runs through different veins until it gets near my heart. I think the PICC is going to be a lot more easier to manage once we get home than the Hickman would have been, so I guess it’s a good thing we switched them out now rather than later. They wanted my platelets to be at least 50 before they took out the Hickman, so I had several transfusions yesterday and it ended up being about 3am before they finally came to pull it. This was not very fun. When the surgeon injected the lidocaine he did it in the most painful way possible. It’s a little bit hard to explain, but instead of just injecting down into one area and then pulling out and going to another area, he kind of pulled up a bunch of skin and injected it sideways and dug around and stuff. I just didn’t prepare myself for that kind of pain and started freaking out a bit and almost went into rigors (uncontrollable shakes) again. Once I got numb the rest of the process was easy; they just pulled out the tube (which I couldn’t feel) and applied pressure to the place in my neck where it actually went into the jugular vein. Then I got a couple of Ambien and slept until about 2pm today. 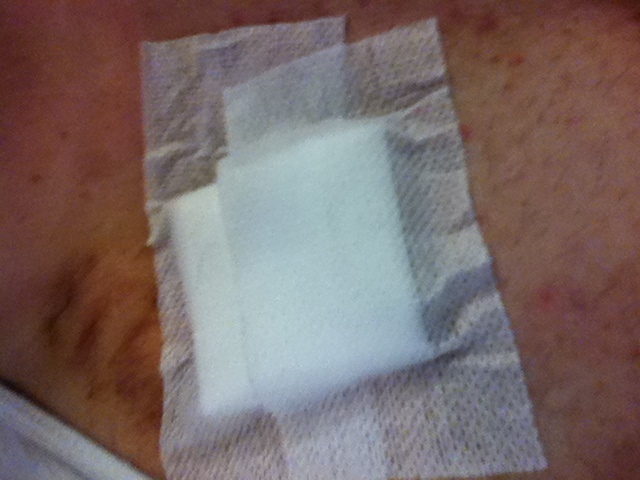 The infected follicle in my armpit started draining yesterday, too. It made it’s own little tunnel in the skin and has been much less painful since that fluid has a way to get out of there. The human body is pretty amazing (and disgusting) sometimes, eh? Today my white cells were back down to 0.8. Everyone said this can happen sometimes, so we’re not discouraged. We know they’ll be back up again tomorrow. I also got more Lasix today to remove some of the fluid I had been retaining. It makes me have to pee every 5 minutes for a few hours, but it’s not too bad other than that. I’ve also been able to eat more today. Everything tastes just horrible, which is a side-effect of the chemo, but at least the mouth sores are to the point where I can chew without too much discomfort. 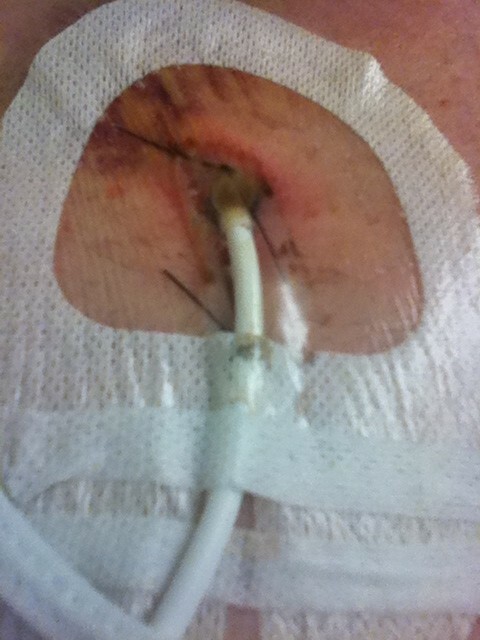 I’ve even had the morphine pump removed! I was barely using the demand dose button anyway, and I’ll need to be on all oral meds before I can be released, so I told them just to take it off. I’m back on the oxycodone again and it’s controlling the pain just fine. That’s all I got for now. Thanks for reading and thanks for all of the support! We got some more great news today. Barring any complications between now and then, it looks like I could be going home early next week! My white cells still need to come up a bit and they’ll keep monitoring me for infection and GVHD, but everything else is still looking great. Melissa went back home again yesterday to finish getting the house ready for me. She had an incredibly long list of things to do and she’s somehow managed to check everything off of it in addition to taking care of me this whole time. She is truly amazing person and I’m so lucky to be able to call her my wife. Once again, thanks again for reading, thanks for the support, and check out the “Become a Donor” page for information on becoming a bone marrow donor. It was a good news day. This morning we got another great report from the doctor. I’m showing the first signs of engraftment! My white cell count has been at 0.2 for over a week (they said it might not ever read 0.0, but the cells were definitely gone) and this morning the count was 0.3! The doctor said I’m not officially considered engrafted until they get to 0.5, but they’re going up. There are no words to describe how moved I was by this video. I cried so hard that I almost threw up… but in a good way. Thank you so much to Brynn, Melissa, and everyone who joined “Team Cam”. This means so much to me, and I will treasure it always. That’s all for now. Thanks again for reading, thanks for the continued support, and PLEASE check out the “Become a Donor” page if you haven’t already.